Home › Psychedelic Drugs › Psychedelic Mushrooms › Are Psychedelic Mushrooms Addictive? Psychedelic mushroom abuse can lead to a variety of adverse symptoms, but it cannot lead to addiction. Psychedelic mushrooms, also referred to as psilocybin, shrooms, or magic mushrooms, are not commonly considered to be an addictive drug. However, certain individuals abuse these mushrooms regularly and other adverse effects can occur. Why are Psychedelic Mushrooms Not Considered Addictive? A person may be likely to abuse this substance in the long-term, but they will experience extreme tolerance for the drug’s effects without the desire to abuse more each time. This causes addiction to be less likely to occur as many individuals will just take a voluntary break from abusing the drug in order to allow their tolerances to lessen and their perceptions to settle again. A person may also do this because, while psychedelic mushrooms do not cause dependence, they can cause withdrawal for up to several days after abuse that makes it difficult for the individual to determine what is real. 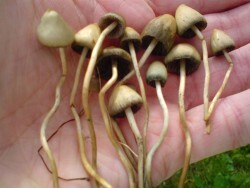 The ability to step away from the drug voluntarily, which many users choose to do at different stages of abuse, removes much of the fear of becoming addicted to psychedelic mushrooms. Is the Drug Still Illegal? Although not addictive, psychedelic mushrooms are still illegal. Psilocybin itself is listed as an illegal compound because the effects of ingesting it can be dangerous. Hallucinations, an inability to determine reality from fantasy, and the possible consequences of an adverse drug trip (like terror, paranoia, and aggression) make the effects of this drug potentially harmful, even without the fear of addiction. Are There Other Long-term Effects of Psychedelic Mushroom Abuse? The issues listed above can be rare, but that does not mean regular abuse of these drugs is unlikely to have its consequences. “Some users experience such extremely unpleasant hallucinations that the fear of that experience remains with them for life” (Brown University). While psychedelic mushrooms may not be addictive, their long-term abuse can cause other problems, some of which may require intensive therapy similar to that which is used to treat addiction syndromes.